This is my favorite summer dessert. 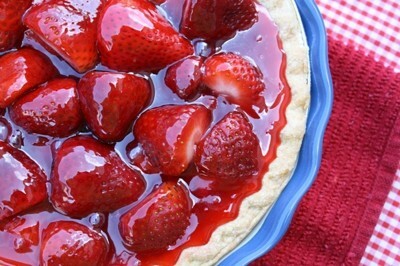 This is the first pie I make when I start seeing those beautiful red strawberries pop in the grocery store or farmers markets. Preheat the oven to 350 degrees F. Line the bottom of your pie shell with parchment paper or foil. Place pie weights or dry beans on the paper. Pre-bake the pie crust until golden brown, approximately 15-20 minutes. When done remove pie weights, beans and parchment paper. Let the pie crust cool completely on a wire rack. 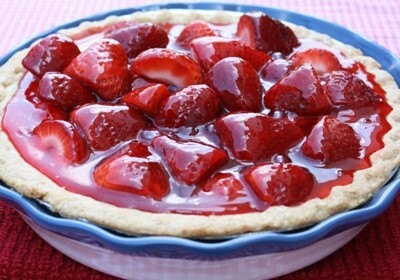 While your pie crust is cooling prepare the strawberry filling. Combine the sugar, cornstarch, gelatin, lemon juice, strawberry extract, and water in a medium size pot. Bring mixture to a boil then reduce heat to medium and cook until the mixture thickens, whisking often. Remove from heat and let the mixture cool to room temperature. A tip to cool down the strawberry glaze quickly: Most times when I make my glaze or any other boiled frosting, I never have the patience to sit and wait for it to cool down. Now I'm a impatient person so that's just me- LOL. Try this little trick to cool down the glaze quickly so you can pour it over your strawberries. I get a large bowl and fill it with ice and water to make a ice bath. Then place the whole pot with the glaze into the ice bath. Using a whisk, I stir the glaze until it cools down and thickens a bit more. You want the glaze to be thick but pourable. Remove the pot from the ice bath and pour the glaze over the strawberries. I love this nifty little trick!